By the end of the 15th century, however, the Norse of Greenland had vanished -- leaving only abandoned ruins and an enduring mystery. Was it treasured Walrus Ivory that drove Vikings to sail thousands of kilometers to Greenland? Some have suggested that trading commodities -- most notably walrus tusks -- with Europe may have been vital to sustaining the Greenlanders. Ornate items including crucifixes and chess pieces were fashioned from walrus ivory by craftsmen of the age. However, the source of this ivory has never been empirically established. For the latest study, published today in the journal Proceedings of the Royal Society B , the research team analysed walrus samples found in several medieval trading centres -- Trondheim, Bergen, Oslo, Dublin, London, Schleswig and Sigtuna -- mostly dating between 900 and 1400 CE. The DNA showed that, during the last Ice Age, the Atlantic walrus divided into two ancestral lines, which researchers term "eastern" and "western." Walruses of the eastern lineage are widespread across much of the Arctic, including Scandinavia. Those of the western, however, are unique to the waters between western Greenland and Canada. They say that ivory from western linage walruses must have been supplied by the Norse Greenlanders -- by hunting and perhaps also by trade with the indigenous peoples of Arctic North America. "The results suggest that by the 1100s Greenland had become the main supplier of walrus ivory to Western Europe -- a near monopoly even," said Dr James H. Barrett, study co-author from the University of Cambridge's Department of Archaeology. Ivory exports from Greenland could have stalled for other reasons: over-hunting can cause walrus populations to abandon their coastal "haulouts"; the "Little Ice Age" -- a sustained period of lower temperatures -- began in the 14th century; the Black Death ravaged Europe. The Lewis chessmen. (Ninox / CC BY NC 2.0 ) These artifacts provide one of the most stunning examples of Norse carved ivory. Co-author Dr Bastiaan Star of the University of Oslo said: "Until now, there was no quantitative data to support the story about walrus ivory from Greenland. Walruses could have been hunted in the north of Russia, and perhaps even in Arctic Norway at that time. Our research now proves beyond doubt that much of the ivory traded to Europe during the Middle Ages really did come from Greenland." The article, ‘ Lost Norse of Greenland Fueled the Medieval Ivory Trade, Ancient Walrus DNA Suggests ’ was originally published on Science Daily. Source: University of Cambridge. 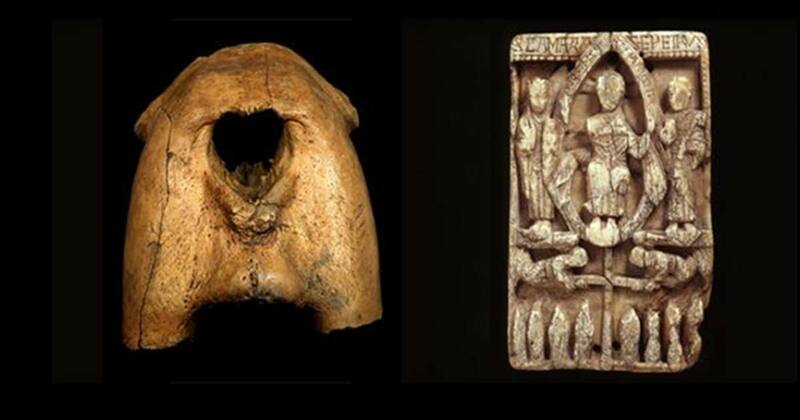 "Lost Norse of Greenland fueled the medieval ivory trade, ancient walrus DNA suggests." ScienceDaily. ScienceDaily, 7 August 2018. They went back inside from where they came. Read more about Was it treasured Walrus Ivory that drove Vikings to sail thousands of kilometers to Greenland?